Check-out this video from the recently held 45X40 Kanshasai Anniversary LIVE & SHOW event featuring the introduction of the Uchuu Sentai Kyuuranger members in their civilian identities! 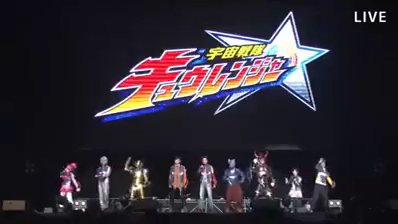 Before the members where introduced to the public, the official trailer for the upcoming 41st Super Sentai series was shown where the official theme song "Lucky Star" was also heard. So who is your favorite member so far? I'm calling dibs on Champ/Oushi Black (cosplay potential for my body built, bro). As for my favorite character... The humanoid one is definitely Stinger and his cool Joe Gibken-esque silence. But really, it's the aliens that made me go crazy, especially due to their awesome seiyuus. Also, the commander is a dragon right? Another constellation, right there... so might we be looking at the 10th member? There are rumors of RyuuPurple being the 10th Kyuuranger. Wouldn't be surprised, given that we've had Deka Master and Kyoryu Silver, not to mention his main color is purple/violet, and his staff looks like it might be able to house a Kyuutama. I actually prefer Violet just because in Japanese, I personally think it sounds better as "baioretto" versus "pāpuru".